Really want it your way? When it comes to accessing the internet, Burger King’s latest social experiment is showing the fast-food company is in full support of net neutrality — the federal policy that requires all internet traffic to be treated equally by internet service providers. A video released Wednesday and entitled, “WHOPPER Neutrality,” pranks real customers and aims to “help people understand how the repeal of Net Neutrality will impact their lives,” according to Burger King. The Federal Communications Commission voted in December to scrap the Obama-era net neutrality rules, marking a major victory for large internet service providers. Essentially, the FCC’s decision could allow the service providers to create so-called fast and slow lanes for subscribers — and open up higher fees that could be passed down to users. But some public officials, activists and tech companies, including Apple, Google and Amazon, have been in favor of keeping net neutrality rules in place, fearing that service providers could also block or slow access to certain websites. RELATED: WHAT’S NEXT FOR NET NEUTRALITY, AND WHEN WILL WE SEE CHANGE? It wasn’t immediately clear why Burger King has decided to take a side on the issue. So for a “slow Mbps,” customers were asked to pay $4.99. For a “fast Mbps,” they had to fork over $12.99. And for “hyperfast Mbps,” the Whoppers cost $25.99 apiece. 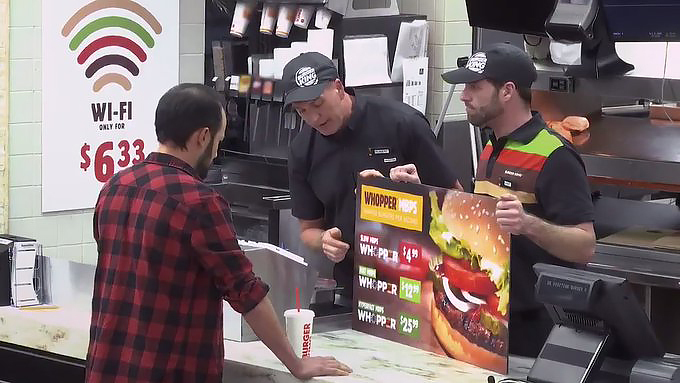 While many of the customers balked at the higher prices — a Whopper typically goes for just over $4 — at least one man in the video paid the premium. “Are you kidding me? You paid $26 for a Whopper?” one woman asked him. “He’s higher priority, so …,” responded a worker. The fate of net neutrality, however, remains unresolved. Attorneys general for 21 states and Washington, D.C., are suing to block its repeal, but internet changes could go into effect as early as this year.